A few weeks after the first order for the new AmerCento series, Permare reveals details on the Amer 136, another series with common specifications. The Amer 136 follows the same philosophy as the modern AmerCento, both projects coming from the board of Massimo Verme. This sporty 42.24 metre motor yacht is unusual in being built with a composite hull and aluminium superstructure. Two hull versions are available with a "Long Range" (semi-planing) and a "Sport" (planing) model. Few details are known for the moment about her layout, excepting that Permare proposes a feng shui design by Elisabetta Pianta, a first in the industry. It will accommodate ten guests in five cabins, including a full-beam master on the main deck. On the technical side, the "Long Ranger" version is available with twin 1,622hp Caterpillar or twin 1,636hp MTU engines, giving a top speed of 19 knots and a cruising speed of 16 knots. The "Sport" version offers twin 2,637hp MTU 16V2000 or twin 3,460hp MTU 12V4000 engines, giving respective top speeds of 27 and 30 knots, and respective cruising speeds of 21 and 27 knots. 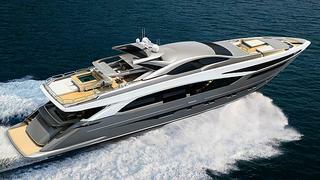 Developed to become the new flagship of Permare, the Amer 136 is ready to be built for her first clients.